Any Shock Mount Reccomendations For Samson G Track Pro? Hello, I've been having some trouble finding a shock mount for my Samson G Track Pro. I recently picked up the Samson SP04 shock mount, which worked for a few minutes before dropping the microphone and refusing to screw back in. After looking at the shock mount's threads, they seem to be much shorter than any of the other mounting threads that came with the G Track Pro. Can anyone recommend shock mount that works for the G Track Pro specifically, or can anyone confirm Is it possible to mount the G Track Pro using the SPO4 shock mount? All google searches seem to point to the SP04 for mounting the G Track Pro, and reviews on the SP04 seem to be split between it G Track Pro friendly and not G Track Pro friendly. Re: Any Shock Mount Reccomendations For Samson G Track Pro? Hope this helps anyone looking for a shockmount for their G track pro! It may cost a bit more than the SP-01, but I'd consider a Rycote USM shock mount, as they are about the best mounts you can get. They will isolate the mic a lot better than the elastic spider type shock mount. The dimensions and weight of the Samson mic on the datasheet seem to include the desk stand, so you'll have to take that off and weigh the mic and measure its diameter to decide which of the USM mounts best suits your mic. It needs to fit within the specified weight limits to make sure that the suspension stiffness of the lyre is correct for good isolation, and obviously the selection needs to be of a size to accommodate the mic's diameter. The other benefit of the mount is that it can be used with any other mic of the right weight and size, so can be kept if you upgrade your mic in future (or add to your collection). Where you able to find a compatible shockmount. I'm looking for one as well. brianh1313 wrote: Where you able to find a compatible shockmount. I'm looking for one as well. I have been stung by the issues discussed here with the G-Track Pro, and I will be sending it straight back to amazon. The thing is designed to sit on a desk, and is promoted as being ideal for streamers, youtubers and so on. I want to create computing/creative tutorials showing how to use software, but I can't put this thing on my desk because as soon as you touch the desk, the noise booms into the mic. Oh, and don't think about getting a mic stand for it because they don't include the adaptor any more. So the only solution is to sit it on your desk as it is designed to do... Just don't touch the desk. Absolute garbage. What did you try to decouple it from the desk? I think that "absolute garbage" is a bit of an unkind assessment given that it doesn't meet your specific needs. For a lot of people, it will be a great mic / interface combo. I have an original G-Track somewhere and it was a great bit of kit for my needs. Let's not forget, you get an interface, extra input, headphone amp and mic for 150quid. That's a lot of bang per buck. Dave B wrote: What did you try to decouple it from the desk? The audio quality is great, I'll accept that, but again, this isn't "my specific needs". They literally promote this for the use I need out of it. 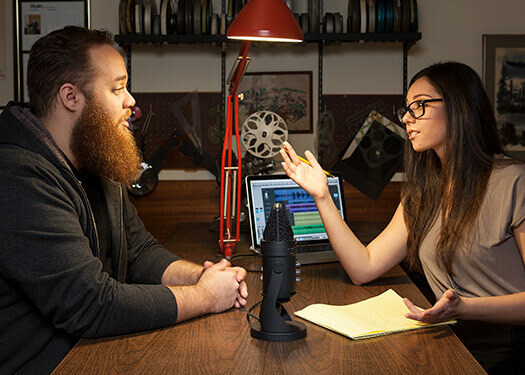 What also grinds my gears is that one of the main images that pops up in their promotional materials time and time again shows a situation in which the mic would be completely useless... You would be hearing her papers and his elbows. 1) Try not to touch the desk. 2) Use a sturdier desk or put a heavy paving slab on it to damp vibrations. 3) Use a software high-pass filter to cut out low frequency vibrations and reduce noise. Saying that, I can understand your frustration and it's probably not a great choice of mic for some recording arrangements given a lack of alternative mounting options available from Samson. In a pinch to decouple I have found the dense rubber of hockey pucks worked well for me. Sometimes I’ll stack a few. A practice hockey puck is a bit softer and sometimes I have combined the two. Considering how affordable they are I keep a few around. Wonks, I'm doing graphics and editing tutorials, so I'm literally using my desk, the keyboard and graphics tablet on it while live-streaming and describing what I'm doing. I've decided (hopefully I won't regret it) to get the SP01 Shock mount, though I'm very annoyed that the only solution was apparently to give more money to Samson. Hopefully I've made the right choice, and haven't actually dug myself deeper into a "wrong tool for the job" hole. Just for reference (as it’s probably too late) but if I’m screen casting and moving my head around a lot, I’ll use a headset microphone, which you could take into a simple USB interface like the Shure X2u. The Rycote USM or USM-L should work fine - just twist the mic. a little so the pads don't touch the controls on the mic. Otherwise - get a small pad of Sorbothane (or similar) and put that on the desk and stand the mic. in its original stand on top of it. That should prevent any vibrations from the desk getting to the mic. AudioNoob wrote: Wonks, I'm doing graphics and editing tutorials, so I'm literally using my desk, the keyboard and graphics tablet on it while live-streaming and describing what I'm doing. I'm in the same situation as you, tossing up whether to purchase the SP01 or not. Did you end up trying this out by any chance?